Sargent Avenue Mennonite Church, August 2017. 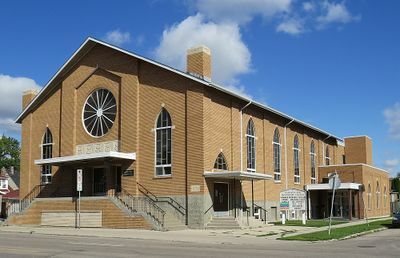 The Sargent Avenue Mennonite Church, Winnipeg, Manitoba began in the late 1940s through the efforts of the Mission Board of the Conference of Mennonites in Canada to help recent Mennonite refugees from Russia. The first worship service was led by Minister Jacob Toews on 11 September 1949. The congregation was first called the Winnipeg Mennoniten Stadtmission. It was renamed Winnipeg Mennonite Mission church in 1950, and became Sargent Avenue Mennonite Church in 1955. Jacob Toews was elected as the Aeltester in 1952 and served as the leading minister until 1958. Throughout its history, the congregation has been blessed with lay ministers who served alongside pastoral staff. The Sargent Avenue Mennonite congregation in Winnipeg began services in 1949, and formally organized in 1950. The first building was occupied in 1951, with a subsequent building program in 1960. Jacob Toews is considered the founding leader of the group. The congregation originated through urbanization from rural Manitoba and immigration. The language of worship in 2006 was predominantly English. At that time a half-hour German worship service preceded the English service. The last German language service was held on 21 June 2009. Canadian Mennonite (5 February 1960): 1; (20 May 1960): 21; (7 September 2009): 23; (23 August 2010): 22. Dirks, Rita. "Sargent Avenue Mennonitengemeinde." Research paper, Canadian Mennonite Bible College, 1979, 30 pp. Mennonite Heritage Centre. Fuenfundzwanzig Jahre: Sargent Avenue Mennonitengemeinde, 1950-1975. Winnipeg: Sargent Avenue Mennonite Church, 1975, 76 pp. Rempel, Jakob. Unpublished history to 1975. Reimer, John and Marlene Epp. "Sargent Avenue Mennonite Church (Winnipeg, Manitoba, Canada)." Global Anabaptist Mennonite Encyclopedia Online. September 2010. Web. 23 Apr 2019. http://gameo.org/index.php?title=Sargent_Avenue_Mennonite_Church_(Winnipeg,_Manitoba,_Canada)&oldid=161460. Reimer, John and Marlene Epp. (September 2010). Sargent Avenue Mennonite Church (Winnipeg, Manitoba, Canada). Global Anabaptist Mennonite Encyclopedia Online. Retrieved 23 April 2019, from http://gameo.org/index.php?title=Sargent_Avenue_Mennonite_Church_(Winnipeg,_Manitoba,_Canada)&oldid=161460. Adapted by permission of Herald Press, Harrisonburg, Virginia, from Mennonite Encyclopedia, Vol. 4, pp. 422-423. All rights reserved. This page was last modified on 28 August 2018, at 11:21.